It was less glamorous than the Spitfires and Hurricanes of the Battle of Britain and wasn’t seen as the backbone of Bomber Command yet the de Havilland Mosquito can arguably claim to be the RAFs ‘greatest’ aircraft of WWII. It was one the fastest operational aircraft in the world, one of the most envied – and one of the most feared. Built almost entirely of wood, the beautifully streamlined ‘Wooden Wonder’ was a triumph of ingenuity at a time when resources of light alloys were in short supply. Its greatest attribute was speed and the Mosquito became the finest multi-role combat aircraft of WWII. No other Allied military aircraft was built in so many versions for so many roles – some 43 different variants were produced during its long and distinguished career. 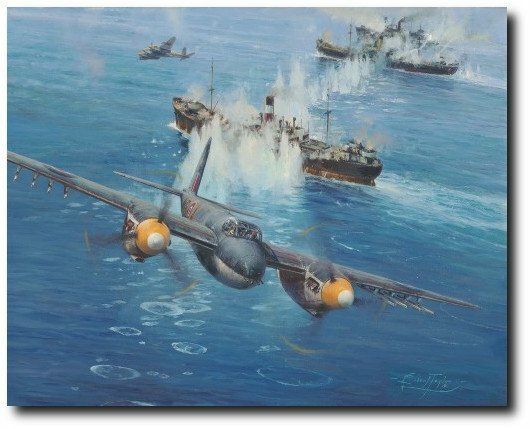 This dramatic tribute depicts Mosquito Mk.VIs from 143 Squadron, part of the famous Banff Strike Wing, delivering a blistering strike on a pair of large enemy ships off the Norwegian coast in early 1945. Their salvo of rockets, however, will likely be enough to penetrate the ships’ hulls. With the edition personally signed by Mosquito veterans, including those who flew with the Banff Strike Wing, this release from the world’s premier aviation artist has all the hallmarks of a masterpiece in the making.